With the Christmas holiday fast approaching, I was blessed with a great excuse to stay indoors and draw, which came in the form of twelve inches of snow in the Philadelphia region. So, instead of finishing up my last-minute shopping, I spent the weekend hunched over a drawing board working on another small charcoal drawing. I had discovered the importance of surface texture in charcoal while working on my previous drawing of the old lock. 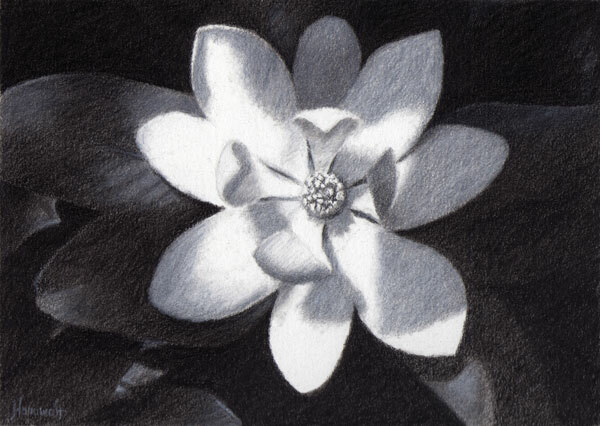 With those thoughts fresh in mind, I moved straightaway into a new drawing of a magnolia flower. Given the delicate nature and texture of the flower and the smoothness of the leaves, I decided to use bristolboard, a smooth, white, hot-pressed cover-weight paper. Having never done a charcoal on bristol, I first did some doodling on a small scrap piece to make sure the charcoal would adhere properly and would go dark enough. The Berol charcoal pencils have a small amount of wax added which helps with surface adhesion, but I also discovered that it creates a shiny buildup over time, and eventually won’t take any more layering of the charcoal. This was easily overcome by applying a coating of workable fixative, which restored the tooth to the paper and allowed me to go heavier and darker in the darkest areas. The real challenge here was trying to hide the lines. I knew that this drawing would require more blending than any I had done previously – both because of the subject matter, and because I was again working on a small surface (5″ x 7″). As I worked, I discovered a method that seemed to work nicely and slowly build up the surface quality I was looking for. I would start with a layer of black charcoal, then blend it with a paper tortillion (I think the tortillions work better than stomps for whatever reason…). On the flower petals that were in shadow I would then add a layer of white charcoal over the shadow areas and carfully blend it. Then I would go back over with black charcoal, blend, and then repeat the whole process again until I felt the shadows were correct. The lightest lights were the bare paper, and I had to take great care with my edges, where a dark shadow met a highlight, so as not to accidentally bleed charcoal into the white space. Overall, I was pleased with the drawing, although it took much longer than I had originally expected. This was due mainly to the fact that it took a long time to build up the darksand keep a smooth surface. In the future I think I will probably stick with charcoal paper rather than bristol. I couldn’t imagine doing a large drawing using this process, no matter how patient I think I’ve become! The scan below shows a lot more line-work than is visible on the actual drawing, but this is mostly due to the nature of light in a scanner. The finished piece has a very nice smooth and delicate appearance. This is most likely my last post of 2009, so I would like to say THANK YOU to everyone who has followed along on my journey and left encouraging comments. This has been a real motivation for me, and has helped me keep my skills fresh and continuously growing. It began with the Bargue Drawing Course, which forced me to slow down and taught me to observe more carefully before making a mark on the paper. In just six months I have found that I’m much more confident in my ability to accurately represent something on the drawing board or the canvas. I hope that the posts here have been somewhat helpful to those who are also seeking to grow as artists, in light of, and in respect to all of the other obligations that we must meet in our daily lives. Thanks again, and may your holiday season be filled with peace and happiness!